Capcom is hosting Free Trial for the Street Fighter V: Arcade Edition in the festivity of Capcom Cup 2018. 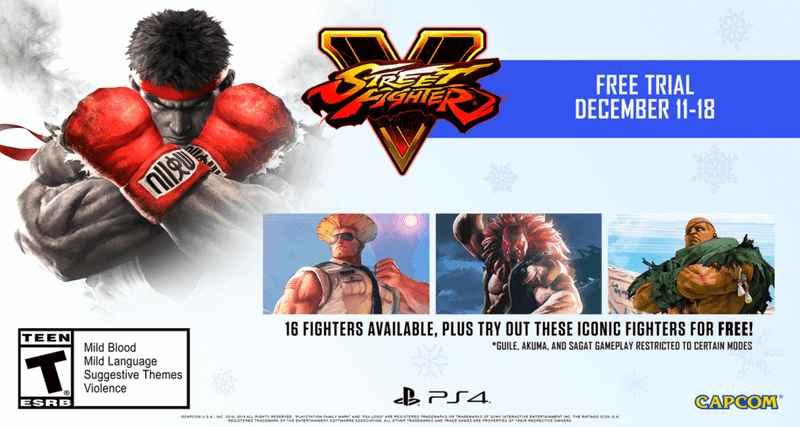 Street Fighter V: Arcade Edition will be free to play from December 11-19 on PlayStation 4 and Steam. Sponsored Content will be brought into Street Fighter V: Arcade Edition on December 11. Sponsored content will be displayed in a few areas in-game. You can easily turn off sponsored content by going into Battle Settings. "We’re hosting a free trial, which will begin on December 11 at 1pm PT (download begins at 9am PT) and will end on December 19 at 9:59am PT. For the trial on PlayStation 4, PlayStation Plus subscription is not required to download and take part, but is required to play online. For PC users, the Steam client is required to take part in the trial. All the initial content from the original Street Fighter V and the modes introduced in Street Fighter V: Arcade Edition are included for free during this time. Loading & Stage Ads – Selecting “on” gives you access to Stage and Loading Ads." Street Fighter V: Arcade Edition is available for PC and PlayStation 4.